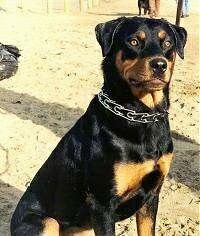 Stella the German Rottweiler at 6 months old—"She is super friendly, protection trained, bomb detection trained and drug detection trained." 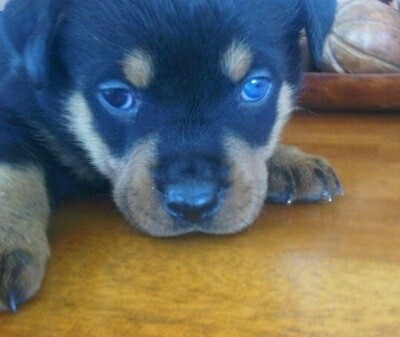 "Sasha-Blu when she was 5 weeks old—she is a purebred German Rottweiler. She was a very active little puppy. 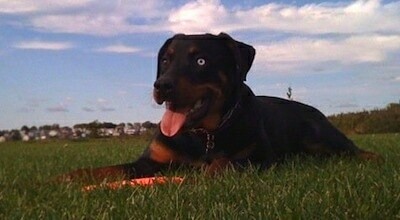 She has one blue eye and one brown eye." 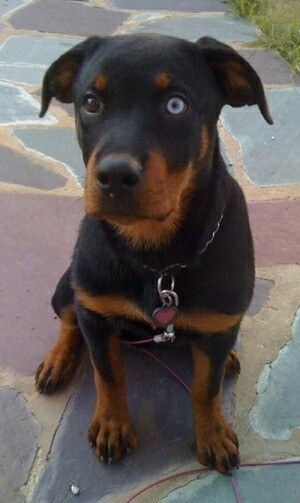 "Sasha-Blu was an amazing little girl when I went and picked her up. She is 7 weeks old and 9 pounds in this picture." 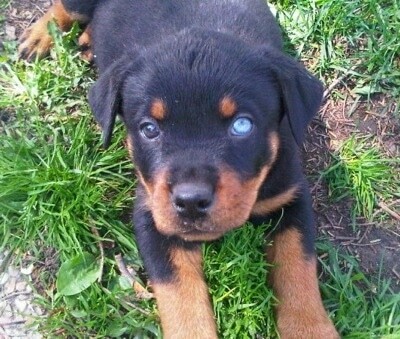 "Sasha-Blu was born with one blue eye and one brown eye. 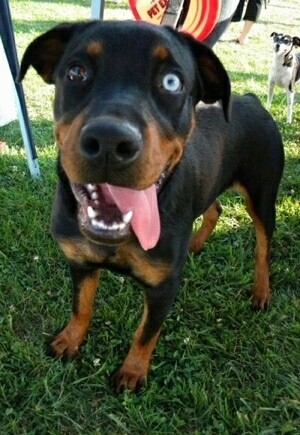 She is not blind; she just has a blue eye. Just like a person! She absolutely loves to run and catch a Frisbee, that's all she wants to do. She is shown here at 4 months old." "Sasha-Blu is a very good dog. 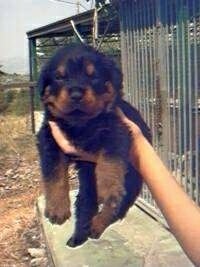 She has changed a lot of people’s perspectives on the Rottweiler breed. Her best friend is a 4-pound Pomeranian! Shown here at 5 months and 48 pounds!" "In this picture Sasha-Blu at the Doggie Day parade! She is an amazing dog. She is my little baby. She is 6 months and 63 pounds in this picture. She is still growing, too!" 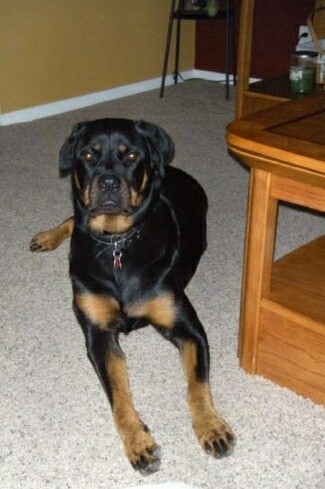 "Sasha-Blu is my German Rottweiler at 7 months and weighing in at 74 pounds!" 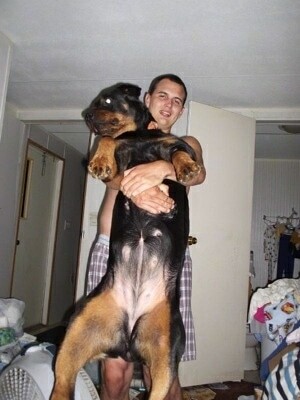 "Sasha-Blu is my German Rottweiler at 8 months old, weighing 80 pounds." 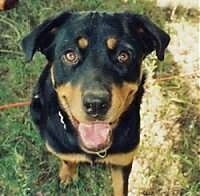 "This is our big baby Marley the Rottweiler who loves to get her picture taken! She will turn three years old in March and weighs 80 pounds. She is the sweetest girl and even gets to come with us to work every day! 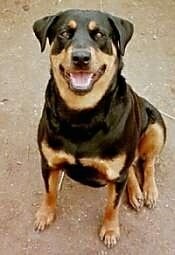 Her favorite thing to do is going for long walks, as shown with the classic Rottie head tilt! 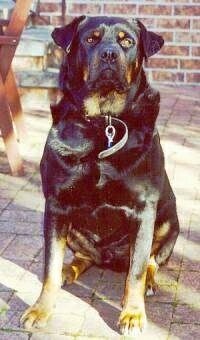 Marley really is a gentle giant, as all Rotties can be with proper leadership and balance. 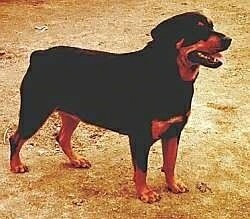 Thanks to Cesar Millan for helping to save and rehabilitate so many Rottweilers and give them back a good reputation! 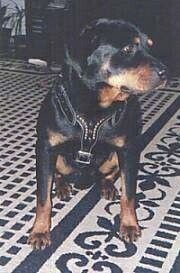 Rest in peace Big Chino the Rottweiler, Marley misses you!" 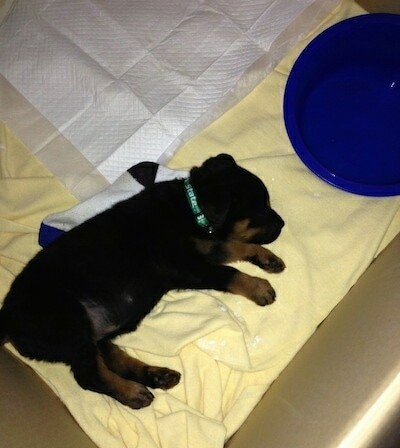 "This is my baby girl Ariel. 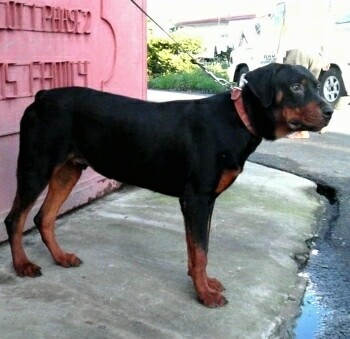 She is a purebred American Rottweiller. 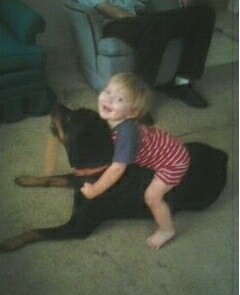 As you can see, she is a wonderful family dog with my 22-month-old son Jayden. She never barks and has the most wonderful temperament ever. She doesn't have any habits other than trying to play mommy to Jayden. She loves rawhide chews. 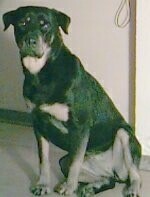 I also have a male mixed Rotti / German Shepherd she loves to chase and pull him by his tail. Her favorite buddy is my son, though." 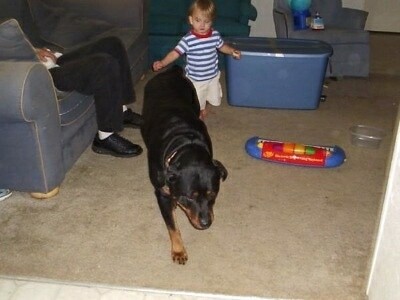 Ariel the American Rottweiler with Jayden—"Jayden loves her because she is like a mini horse to him. They share toys and he loves to feed her. 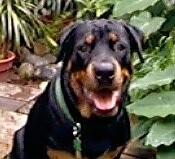 As a parent, I would never have another family dog other than another Rottweiller. They are such wonderful family dogs. They are great with children." 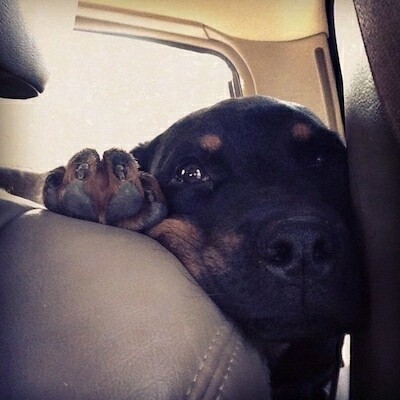 This is Honey the Rottie. 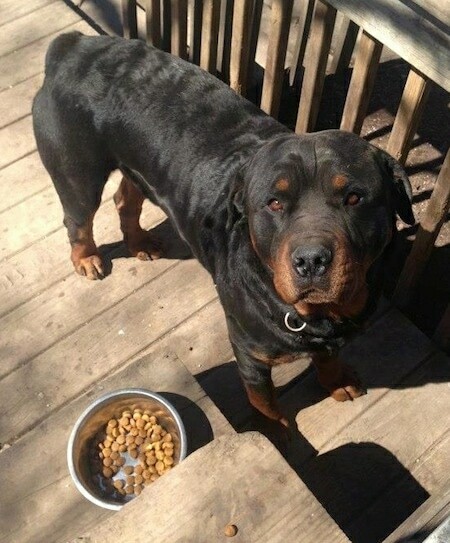 This is Beau, a 2-year-old Rottweiler that was rescued from the pound. He's a big baby and loves nothing more than to sit on his owner’s lap, all 100 pounds (45 kg) of him, while you watch TV. 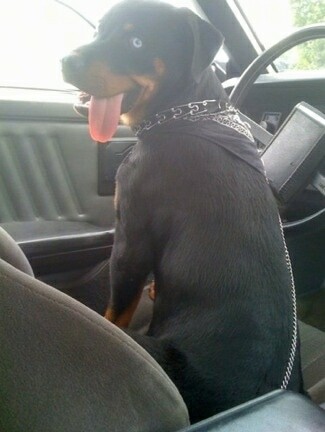 Gretea the 1½-year-old mischievous Rottweiler! Can we come out and play? Left to right: Shanya, 2 years; Harrison, 18 months and Dakota, 1 year. 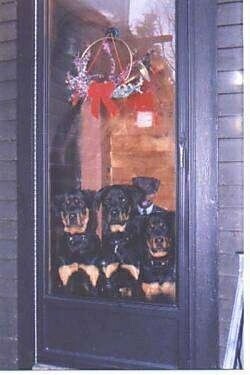 Photo courtesy of North East Rottweiler Rescue & Referral, Inc.